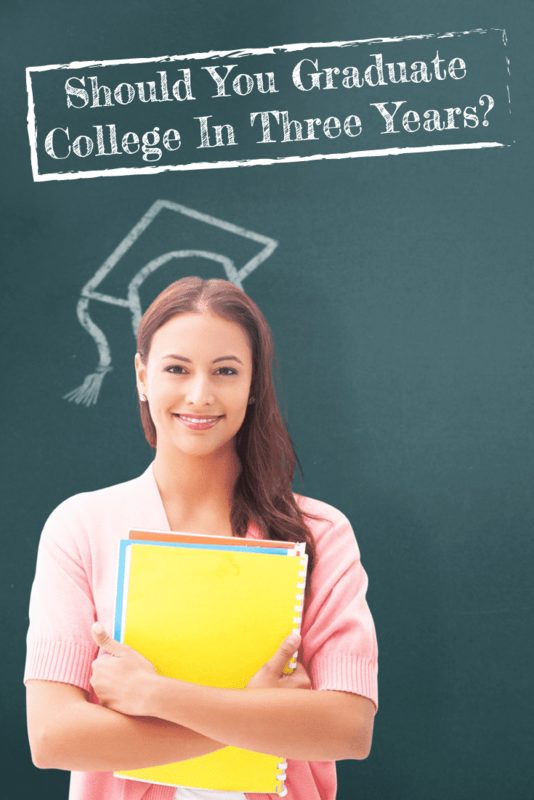 Home » Should You Graduate College in Three Years? Most people look forward to the college experience, but some of us just want to get out of school, start earning money and pay off debt. As your school year drags on, you wonder if you could shorten the time that you sit in the lecture hall, diligently taking notes. The typical undergraduate degree is expected to last 4 years, with some students stretching it out to 6 years. While most universities encourage students to stay the course with a 4 year degree, other institutions offer resources and tools to help students graduate sooner. With the cost of a traditional college education steadily on the climb, it is not surprising that college students are trying to fast track their college education. It all sounds good on paper- get out of school faster, save money, and get a job faster. Or if you’re in a hurry to get to grad school, you want a cost effective method to quickly complete your undergraduate education. Can you graduate in 3 years? Yes. Many students have successfully completed college in 3 years, and the experience was worthwhile. While it’s hard enough as it is just to graduate in 4 years, with the proper planning, it can be done. Some people have even successfully graduated college in 2.5 years. But it is not for the faint of heart. Be ready for long nights, a tightly packed schedule, and less nights out. Is this a smart move for you? Should you graduate in 3 years? Decide for yourself after reading the pros and cons below. The most obvious advantage is saving time and money on that extra year of tuition and expenses associated with the academic year. Academic advisors and professors advise to prepare for all scenarios if you plan an early graduation. Some college students are in a rush to be adults and experience the “real” world. They want to graduate sooner so that they can enter the job market, start earning money and living the life they want. Students seeking a graduate education can start their graduate program earlier and shorten the overall amount of time spent in school. If you start working sooner and putting aside money for your savings or retirement immediately, then you have also created good habits to maximize your earning potential. Aside from savings, you can also avoid accumulating student loan debt by starting to make payments before interest accrues. If you graduate early, you can create a plan to repay your student loan debt that works with your budget, rather than trying to pay it off too early. Finishing college sooner means less time to engage in social networking, making connections and developing skills. You want to develop a network of colleagues where you can help each other with professional opportunities, both now and in the future. When you’re on a deadline to graduate fast, you may not be able to get all the classes or electives you want. Or even worse, you may have to take electives that are useless just to fulfill requirements, simply because the courses you want are not available when you want them. More importantly, you might miss out on opportunities for internships and externships. Employers reveal that they want to hire people with practical work experience, which is often earned through internships and externships. In addition, your deadlines may limit your ability to study abroad. If you are looking for a job in the insurance, banking, and entertainment industries, it is important to remember that many of these companies hire almost exclusively out of internship programs. Regardless of how soon you plan to graduate, be sure to make time for internships and externships, especially if you are going into an industry where they primarily hire from such programs. Once you graduate, the clock starts ticking to pay off your student loans. While you can defer your student loans, you want to avoid that as much as possible. Learn more about how to escape student loan debt and live the life you want. 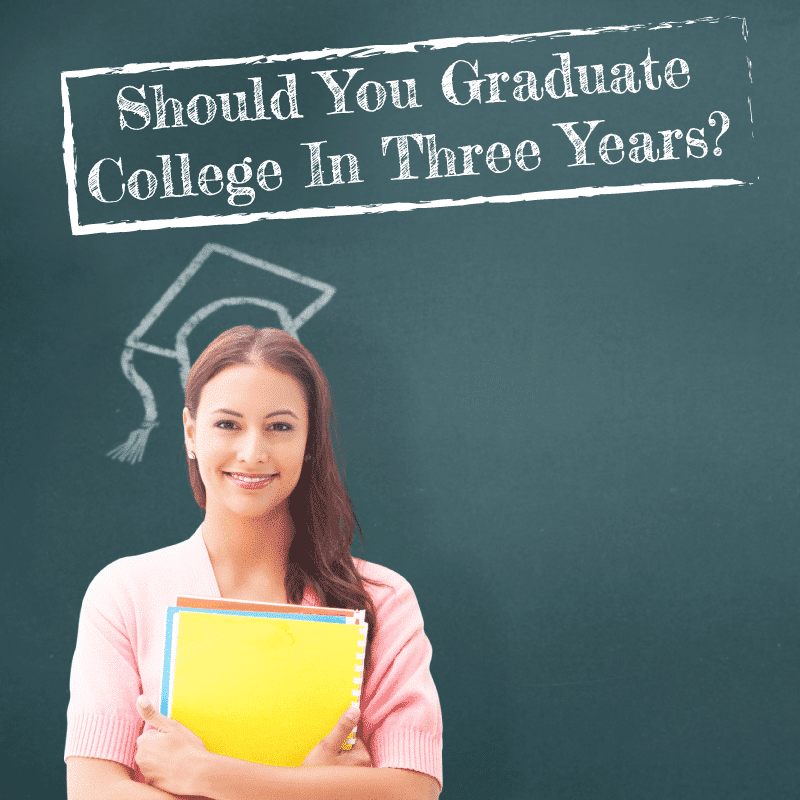 Now that we have weighed the pros and cons, let’s move on to the steps to finishing college in 3 years or less! Be Efficient with your time. Graduating fast is all about optimizing your time and being efficient with your schedule. When you determine your maximum course load, consider study time and class times before making the commitment. Plan your schedule carefully. Consider which classes have to be taken in what order, and availability of courses during the academic year. More importantly, take the classes that fill up quickly first, as your schedule and prerequisites permit. Don’t slack off in the summer. Take difficult courses over the summer so that you have a lighter load and more time to devote to getting higher grades. Make use of community college course offerings: Taking summer classes at a community college while in high school will help you save time and money. Just be sure that the credits transfer to your university. Take full advantage of online options for your coursework. You may be able to take some of your classes online, while other classes will be limited to a live format. Be sure to set aside extra study time, as some online classes may require additional work. Make use of all Advanced Placement (AP) credits: If you took Advanced Placement (AP) classes in high school, be sure you got credit for them to avoid repeating prerequisites. Credit for military service: If you have served in the military, learn how to get school credit for military service. Take CLEP exams for college credit: Use CLEP to fulfill general education requirements by passing exams. College Level Examination Program (CLEP) exams cover material you would cover in your first two years of a 4 year degree program, ranging from foreign language to math. At $80 per exam with up to 33 tests available, this is a frugal and efficient method for knocking out those general education requirements. Now, knowing what you know, should you graduate in the next 3 years? Only you can decide. To help you make the right decision for your life, examine your priorities and requirements. 1. What’s the benefit of graduating early? What is waiting for me on the other side? It could be a job opportunity that caught your eye, or the prospect of paying off debt or starting a family sooner. Whatever the case may be, know your “why” before embarking on this ambitious journey. 2. What will I miss out on if I graduate early? No one can answer this except for you. This is really about priorities. Do you want to enjoy the college experience, such as spring break, a summer trip to Cancun and studying abroad? Would you rather forego or limit those experiences to graduate faster? 3. What if I don’t know what I want to do? College students are known to change their majors a few times while earning their undergraduate degree. In the face of indecision, students may benefit from waiting before they declare a major. If you’re not sure about what you want to do after college, you may need some time to figure this out. If you’re absolutely certain about your career path, you will probably not have to wrestle with this decision. If you are faced with the dilemma of changing your major, you could also embark with a plan to graduate in 3 years or less, and readjust if you decide to change your major. Remember, it’s your life, and nothing is set in stone unless you make that decision. 4. How much am I really saving? Be sure to factor in the cost of summer school and winter break classes, plus extra charges you may rack up during the regular semester above a certain number of credits. Whether you’re in college or about to graduate, you need to know how to manage your student loan debt and avoid making some of these common mistakes with student loans. Did you graduate in 3 years or less? What are some of your best tips for college students looking to fast track their college degree? Tell us in the comments below.